The scalper uses the model of a quantum set of algorithms and can work on any financial instruments. Due to the optimal number of parameters necessary for optimization, you can create unique trading strategies based on quantum models. All orders are opened with a strictly fixed Stop Loss. New sets are in the "Comments" section comments #423-428. A multi-level model of a quantum set. To use Trailing Stop, it is highly recommended to have an account with zero Stop Levels. Start trading - enable/disable the Expert Advisor. StopLoss - stop loss value, depending on the trading style (if set to zero, ATR values are used). Slip - maximum allowed slippage. MagicNumber - unique number of positions opened by the EA. Minimum distance between support orders - the minimum distance between support orders. DepoStep - deposit size step for doubling the initial lot. 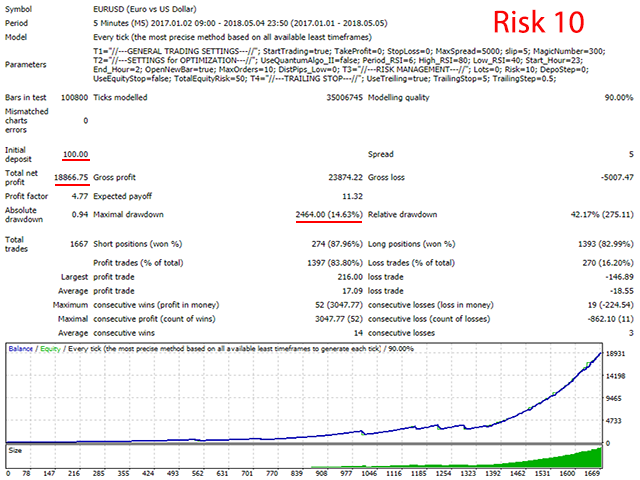 It is activated, if the values of Lots and Risk are zero. Stop by equity - enable/disable limitation of losses by equity. Value of equity - allowable loss by equity, at which all orders previously opened by the EA are closed. Use Trailing Stop - enable/disable the Trailing Stop parameter. The size of the correction Trailing Stop - price range in points from Fixed trailing size to trigger Trailing Stop. One could make profit for a while, BUT there is a bad exit strategy behind when it goes wrong. You could stay turning of the ea during some events but this could not be the meaning of an autonomic EA. Awesome EA and great support service from Mr Andrey! Got my respect! Don't be greedy and you will be fine. Set files not fit for purpose just lost my account, luckily not to much in there. I just bought it and burned my 2000 pounds account on the 1st day... Useless and just a waste of money! I would like to say something here. I have been testing all the promising EA's on the market for a good year now. I must honestly say that many good here are offered! Marauder is a particularly good one as I have stated. Very reliable and stable. I also judge the price performance ratio in the Excelent. Basically, this EA should not be so cheap. In this sense, I wish you all a nice Sunday! Keep your ears stiff !! Good EA , Good Customer support, Fast reply, Good Profit. You can also pick set file for your own risk , standard, Extreme or super Extreme. Awesome Ea. Very impressed. Ran on a live account with $100. Almost 70% return in a month with less than 1 % down draw, using the extreme set files on 3 pairs. I cant believe how well it went! Andrey was very responsive and helpful. Would love more sets for other pairs. So happy! Currently I am testing EA on historical data, and on demo account in real time. I have tried several settings. It has been promising, especially GBP/USD. Works fine, has yielded a good return over the last few days. I use the EA on several crosses, but GBPUSD and AUDUSD got the best return. 1. Added option to close orders by time. 2. 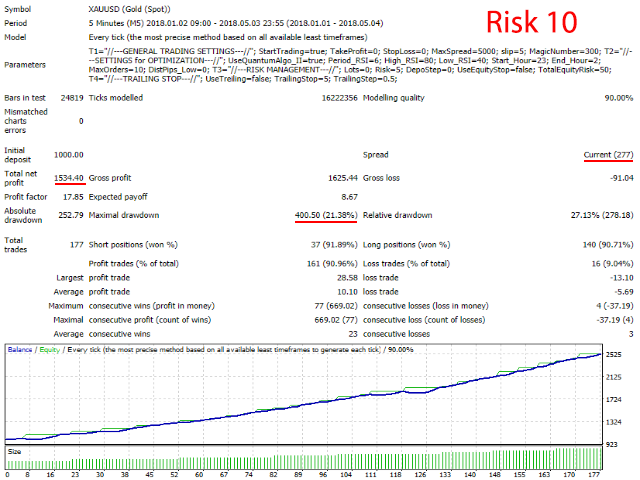 Added parameter "Trailing Take Profit". 1. Added option to increase the lot size for support orders. 2. Added time limit option for support orders. 3. Added 2 levels of quanta. 1. The function of automatic calculation of the distance between orders based on the smart algorithm has been changed. 1. Added function after activation of which the distance between orders will be based on an smart algorithm - the more orders in the grid, the further the distance between the orders. 2. Quantum algorithms are improved. Added ability to limit trading during a Friday evening session.